Now on Hybrid Stereo SACD — The 10 best songs from the acclaimed Joe Walsh-led trio! The 10 best songs from 1969's Yer' Album, 1970's Rides Again and 1971's Thirds. The James Gang, formed in Cleveland, Ohio, in 1966, may be best known as the band that was first to feature guitarist/vocalist Joe Walsh before his rise to stardom as a solo musician and a member of the Eagles. 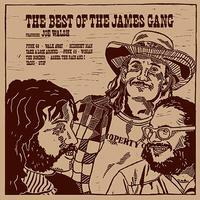 The James Gang performed with a stylistic versatility, hard-rocking edge and ultra-sharp musicianship. Their power-trio template has never sounded fiercer than on this Analogue Productions Hybrid Stereo SACD. Mastered by Kevin Gray at Cohearent Audio — directly from analog tape to DSD — you're hearing 100% AAA analog sound. You'll hear James Gang favorites including the FM radio staple "Funk #49," — kick-started by the outspoken declaration "I sleep all day, out all night/I know where you're goin'" — the sexual thrust of the head-bobbing "Woman," and proto-metal slash of the multi-part "The Bomber." The rest of the track list is just as steeped in psychedelic-and-blues-leaning discourse. "Midnight Man," "Stop," "Yadig?" "Take A Look Around," "Funk #48," "Walk Away" and the Jack Nitzsche-orchestrated "Ashes the Rain and I" are rounded out by Walsh's Echoplex-equipped slide guitar, and his trio-mates, band founder Jim Fox on drums, piano and vocals, and bassist Tom Kriss, later replaced by Dale Peters. The James Gang burning on stage with the audience getting higher and higher. Listen — this is American music — strong, inventive and clean.